Getting many long WhatsApp voice messages? 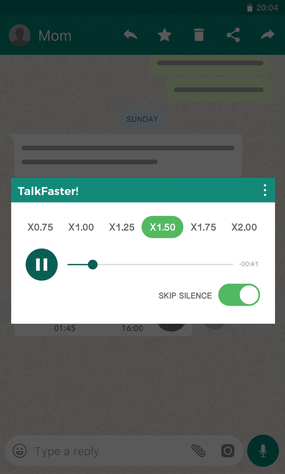 Using TalkFaster you can speed them up! Accelerate voice recordings of any app that supports file sharing. Speed up voice messages, speed up podcasts, speed up music - the sky is the limit! This app's interface works by sharing the voice messages, so no root or patching is required. ★ Listen to voice messages without notifying the sender - no more blue ticks!